If you are using Google Maps Local Business Center, you can stop reading. If you are not using Google Maps Local, and your potential customer’s search terms include the name of the city, town, villiage, state, or geographical description of where your business is located, keep reading. Often, searchers narrow their search results by adding one or more location-specific terms to their search. 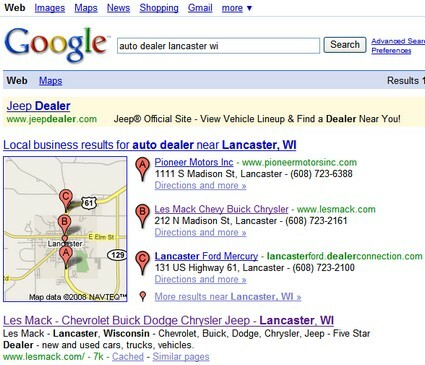 For example, the search term, “auto dealer lancaster wi” yields the following. Who benefits? You get more visibility. The user gets more relevant results with less work. Win, win! Obviously, if you are in a rural area, there normally will be less competition. Consequently, rural business will generally have even better visibility. Even if you don’t get the click that time, it is still branding, branding, branding. The position of where Google displays the map and listings varies from query to query. Sometimes, you’ll find it directly below one or more “Sponsored Links.” Other times there may be two or three organic listings above it. Or, there may be a video link above or below the Local business results. So, how do you get listed? It is easy. You may already be listed. Google pulls your address and other information from public data. If you search for your business, and click on the “Directions and More” link. (see example above), you find more info and you will notice an “Edit” link. In the bubble on the map, you will see “Are you the owner?” and a “Claim your business” link. You’ll need a Google Account, which many of you have. If you don’t have one, you can sign up and follow the instructions here. Note: The street address you enter will be shown in the Google Maps search results. So, why should you use Google Maps Local? Oh, yes. It just plain gets results. The bottom line is, you get a highly-visible link that most users will notice and click on before they click on Adword advertisements or organic listings. Bonus Thought: You can safely bet that Google will continue to very aggressively push Google Maps and related advertising in the mobile hand-device market. Don’t wait. Get Local, and Get Traffic Quickly!